Wondering what variety of juniper this is. Thanks! Hi. That is juniperus conferta 'Golden Pacific'. It's commonly known as a shore juniper. This is the chartreuse variety of shore juniper. It's one of my favorite "go to" plants in garden design. It can take full sun to partial shade, although it turns more yellow in full sun. Thanks for the question! Happy gardening. ‘Van den Akker’ is the narrowest and one of the most desirable cultivars. This tree grows to a height of 25 to 30 feet with a spread of only 1½ to 2 feet, excluding the low skirt, which can be easily removed. This form looks great in groups of three, especially when rising out of a mass of creeping junipers. ‘Green Arrow’, another cultivar, is almost as narrow and can be planted with similar effect. These intermediate-growing Van Den Akker Alaskan cedars (Chamaecyparis nootkatensis ‘Van Den Akker’, zones 5 to 8) are a good choice for a small urban courtyard. This tree can be expected to grow to a 10-year height of 15 to 20 feet, putting on 6 to 10 inches of growth per year. Additionally, this conifer stays less than 2 feet wide. Consider shape. Whereas size appeals to us on an emotional level, shape reaches us on an intellectual, almost empirical, level. Notice how the variegated Japanese water iris (Iris ensata ‘Variegata’, zones 5 to 9) injects interest into this vignette while providing a point of transition between conifers. The light, vibrant hues of the iris foliage speak to the bright, spring-like hues of the Golden Pacific shore junipers (Juniperus conferta ‘Golden Pacific’, zones 6 to 8). The shapes, however, contrast. The iris is quite vertical, while the juniper exhibits horizontal growth. 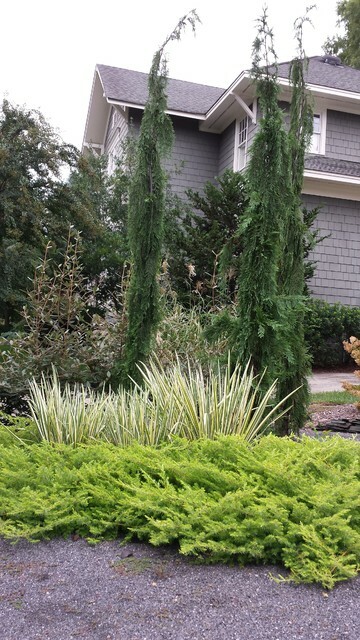 The shape of the iris foliage does, however, mimic the shape of the much taller Alaskan cedar (Chamaecyparis nootkatensis ‘Van Den Akker’, zones 5 to 8), effectively pulling the garden together. saygabba added this to Conifers! Van Den Akker Alaskan cedars (Chamaecyparis nootkatensis ‘Van Den Akker’, zones 5 to 8) are a good choice for a small urban courtyard. This tree can be expected to grow to a 10-year height of 15 to 20 feet, putting on 6 to 10 inches of growth per year. Additionally, this conifer stays less than 2 feet wide.